Skullsworn is a book that really shouldn’t work. There, I said it. I meant it. I’m not taking it back. But it really does work. I read this book on Audible, narrated by Elizabeth Knowelden, and I’ll point out right now it is beautifully narrated. I’m not the biggest fan of audio books and I frequently struggle with narrators, but Knowelden does such a fantastic job I’ll be checking out what else she has done. Moving onto the actual story itself. Skullsworn is about Pyrre Lakatur (if you’ve read Staveley’s Chronicles of the Unhewn Throne trilogy you might recognise that name). Pyrre is a young woman and kind of like an assassin in training with one last trial left before her god and her order will accept her into the ranks proper. The only problem is that trial is to kill seven people in ten days and not just any people; there’s conditions. And the final condition… she has to kill “the one who made your mind and body sing with love / who will not come again.” Pyrre’s problem with this is she has never been in love and doesn’t even really know what love is. The main story of the book revolves around a convoluted plot Pyrre constructs in order to make herself fall in love with a man she met many years ago. How convoluted? Well not to give too much away, but she pretty much tries to burn a city to the ground in the fires of revolution just to have a reason to be near the guy. It’s fair to say our assassin in training has some issues. Sounds good so far. But why, I hear you ask, should this book not work? Well that’s because its basically 15 hours (448 pages) of philosophical meandering over the meaning of love and the importance of letting it go set against the backdrop of ticking clock. Pyrre has ten days to fall in love and no idea what the word even means. Her supporting cast and witnesses to her trial have their own opinions on the matter, and given that they are themselves in love with each other, also provide tangible evidence of what love is to Pyrre. But still she doesn’t know. She flip flops constantly over whether she’s making progress and agonizes over how she’s going about the whole affair. But it works. It works so incredibly well because Pyrre is such a compelling character and Staveley writes with such gorgeous prose (and Kowelden delivers a stunning performance to boot for us audio readers). You might think, with such a lot of philosophising that the book is fairly slow paced, and in some ways it definitely is, but it never drags. 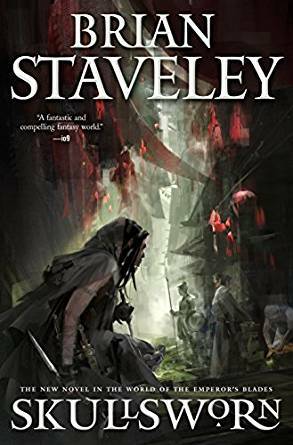 There’s always something happening and such a lively and well defined cast of characters that it was truly compelling throughout (this is a welcome change as I found a few of the characters in Staveley’s Unhewn Throne trilogy quite flat. In fact I described one of the main cast as a potato and I stick to it!) There’s tension in spades as well and not just because of the ticking clock of Pyrre running out of time. The book is quite literally set in an environment that is actively trying to kill everyone around it, and there is a looming threat of something larger than all of the characters waiting nearby. At the end of the day this book won’t be for everyone. It’s far from a standard fantasy tale and simply should not work. But it really does and I loved it. Staveley takes my favourite character from his trilogy and gives her a compelling back story that only serves to solidify her as the best of his creation. 5 stars from me. Brian Staveley has created something truly special in Skullsworn. It’s, for me, best book published in 2017. It’s certainly a contender for me too. But I’ve read SO many good books this year!